Description M4A3E8 Sherman of the 14th Armored Division with sand bags as improvised armor. 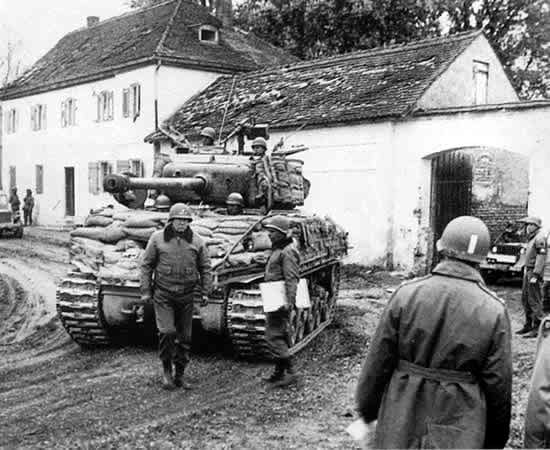 Trivia: The man in front of the Sherman is General George Patton, who had just chewed out the crew for their sand bag-equipped Sherman, which he had banned in his units for being a burden to the Sherman's suspensions. Author Unknown, Official US Signal Corps photo. Permission Image taken by a U.S. Army soldier or employee. As a work of the U.S. federal government, the image is in the public domain. This page was last edited on 29 December 2018, at 03:22.